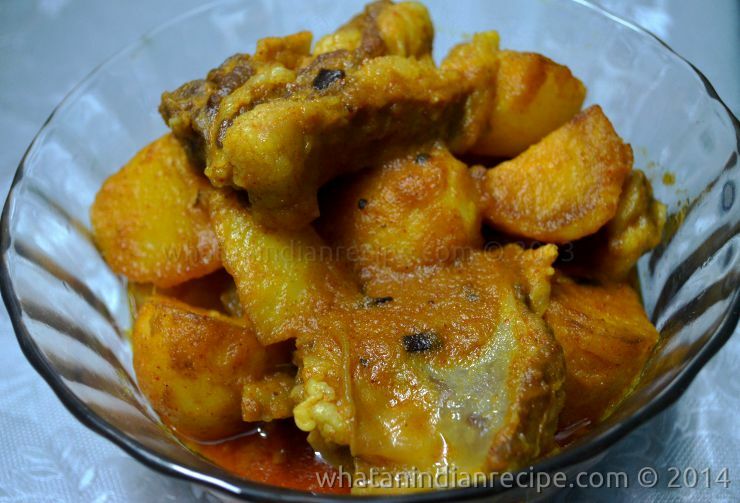 Kosha mangsho is a typical Bengali preparation, generally spicy with a thick gravy, made with simple ingredients. It’s best enjoyed with roti/ parantha.Goes pretty well with rice too. Marinate the mutton pieces with all the ingredients (marination section) for at least 1 to 2 hrs. Heat oil in a cooker, add sugar to it so that it caramelizes, to this add tomato puree and again mix well, then cook with lid open for 10 minutes. Add enough water and close the lid and coo k the mutton up to 7-8 whistles. Once the steam is gone open the lid and cook till the mutton is tender and they right gravy consistency is attained. Add garam masala powder along with boiled potatoes and mix well, finally garnish with chopped coriander.